Sometimes you just need a quick make, a satisfying little bit of sewing that takes hardly any time from start to finish. I was in need of such fulfilment this week and chose to make these cute little baskets using Ayumi's Organizer Basket Tutorial. It just so happens that they each fit six spools of Aurifil thread perfectly! My tidying / decluttering / cleaning kick continues and I'm pleased to say my house is looking all the better for it! I still have a lot to do and am working my way round the house bit by bit. Each room is making me happy as it gets sorted out. Cute storage baskets that serve a purpose help too! 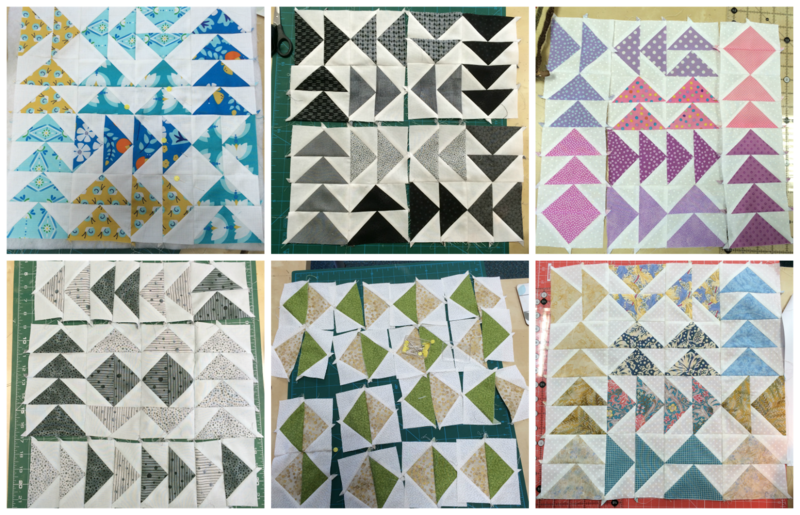 I expect I will be making more and filling drawers with quilty goodness. Wishing you all a productive and sewing filled weekend! Looks like little one really loved the snow! Cute little baskets. I admire your dedication to organizing your house... And squeezing in the small projects in between. My DIL sent me a video of our 2 year old grandaughter running for joy in the Manchester snow. When DIL asked "what is it Rose?" She thought it was a request for a photo and complied with "Cheeeeeeeese". So cute. sweet little baskets, filled with gorgeous Aurifil - what more do you need?! I love semi-instant gratification sewing! Cute little baskets! love your storage and the little one's photo! The flying geese are great and glad to hear you have a lovely group! Those storage baskets are fun... Are you considering colour co-ordinating them with the threads to go inside? I made 2 pillow covers this week for precisely the same reason! Your little baskets look especially sweet filled with pretty threads :) Your babies look precious in the snow, too! Fun fabric baskets and a much prettier way of organising threads than using plastic containers. I can imagine your flying geese class was lots of fun, I so agree it's always great to see the different colours people use. Happy snow fun, I hope your eldest is feeling better soon. Quick finishes are always fun! Those baskets are great...I'm sure I could find a use for some at my house too. When you finish organizing your place, would you like to come do mine? It sure could use it :) The snow play looks like it was fun too! Thanks for linking to TGIFF. Those little fabric baskets are so perfect for your thread! ANd you are obviously a very good teacher! A+ for the flying geese blocks! Love those little baskets and the snow photo! Glad the house de-clutter is going well and you are feeling the benefit of it. The geese cushions are going to be fabulous! Cute baskets! I must make some too, than you for the link. Cute DS baskets and great flying geese some gorgeous cushions from your class. These little baskets are gorgeous and the last pic is fabulous!